This reminds me of the dodgy double-glazing companies that shutdown on a Friday owing thousands, leaving customers high & dry and set up again on Monday with a new name and a clean slate to continue the cycle. Except the impact of this particular company is 1000% worse. Miserable, evil sods! I think the Atos Occupational Health business and Atos Healthcare were always separate – the former contracts to occupational health services for staff of their customers while the latter does the WCA. I note that the website for Atos Healthcare is still running, and the website for OH Assist is copyright to Atos IT Services so I think those names are continuing. I suspect the Atos name has become too damaged for the occupational health business to continue with. My bet is that once the WCA is finished with Atos Healthcare will be shut down in the hope that the campaigners and the reputation will go away. They considered ‘Punishing the Disabled for Profit’ as a title but rejected it as being too damn truthful. This follows a number of other companies, who have been heavily involved in the promotion, formulation or implantation of disastrous policies over the years, changing their names to appear better and more public oriented. Anderson Consulting, the accountancy company that has effectively wrecked the British civil service through its work with successive government from Major onwards, is one of the these. The name changes, but business goes on the same as usual. Sh** by any other name would smell as foul! I saw the anagram in this straight away, and now you’ve explained that the name refers to a rebranded ATOS, it makes sense for people to realise “SO, AS SH**” then, doesn’t it? To be honest I didn’t have a problem with the occy health side of ATOS, the doctors who examined me were excellent and thorough, it was the assessment side to make the decisions which incidentally ignored the occy health doctors reports entirely which was the problem. Or are they just getting ready for taking on a new role in the DWP’s Health and Work Service due to start later this year!!!! How much did Atos cost the taxpayers? How much it saved? I wonder if it is possible to find this information. Also the amount of deaths due to stress from Atos hounding. I’m taking the Information Commission (and by proxy, the DWP) to a tribunal in the spring, in order to find out how many have died. It is imho an attempt to remove the IT part of Atos away from the appalling Health Services to keep at least one side of the company looking nice and clean for investors. oh..oh what a way to celebrate my birthday today only we haven,t got rid of the deadly atos..same company different name still out for profit ..grrrrrrrrrrrrrrrrr..i thought atos via the dwp and government would still do the dirty on us sick and disabled despite 11,ooo poor souls losing there lives to dwp and atos . They seem to be slightly different businesses. RIP all Atos victims who could not endure the onslaught of indignant torture and the loss/theft/removal of benefits thus rendering them no longer able to live on in the country they were born, grew up in and lived. You were forced into a dreadful state of mind and life by an unelected government where you had to take your own life to escape. Nazi-minded staff seemed to enjoy their parts in destroying your life too. Mainstream media will play it down but the people DO KNOW and memories are long, this WILL be a part of the people’s history in Britain whether the mainstream media state it or not. ‘Remember what the Conservatives and Atos did’…. yes we do. “ATOS is freaking everywhere! ATOS Origin is the overarching French company that all other parts divert from. KPMG is a subsidiary of the French parent company ATOS Origin. It is an auditing company which is being used by many local and central government services and providers and is used to analyse and hold to account NHS services around the country. ATOS Worldgrid – “With over 1,600 engineers and over 30 years experience, Atos Worldgrid operates in more than 15 countries. It has in particular equipped 70 nuclear power units with its Supervision and Command & Control software in France, UK, Russia and China and delivered the world’s largest smart metering system.” It is also involved with digital infrastructures that the oil and gas industries use and also transport and distribution networks for the oil and gas industry. in Switzerland, Czech Republic, Bulgaria and Austria they provide e-ID card, e-passportss and other biometric solutions. A £300m (Atos Origin Alliance (AOA)) contract with NHS Scotland in November 2006. AOA (formally including BT) with Atos and Sopra is a 9-year deal with an option to extend for 3 years to an 11-year contract. Services delivered are directly to NHS National Services Scotland (NSS), a non-departmental public body (similar to Atos’ EIS contract of non-departmental public bodies made up from SDS/SE/HIE and SCCRC) other that works to support Scotland’s health and frontline patient care by delivering essential national and regional services to NHSScotland, negotiated the national IT services contract with the Atos Origin Alliance. A multimillion outsourcing contract to NS&I to deliver customer-facing and back office services to NS&I’s 25 million customers. The final decision on awarding the contract lay with NS&I’s Minister, the Economic Secretary to the Treasury, Sajid Javid MP. Given the size of the contract the Cabinet Office was also involved throughout the tender process and has given full approval to the decision. Some expensive consultancy firm has sat down with ATOS in a room somewhere and brainstormed thier way to OH Assist! The cash splashing around and mugs and mugs of coffee. You really couldn’t make it up. Absolutely disgusting move by Atos trying to keep their £100million+ government contract by simply changing their name. As they (Atos) have been in talks with the Tories since August it would not surprise me if the government has colluded with them and they thought this name change up together. The sneaky b*****ds have failed in their mission though – whatever you want to call yourselves, the public are on to you! Hmm, jumping to conclusions a bit here Mike. That section of their business deals with Occupational Health for corporate clients. Interesting – I had it flagged up to me as a new company by a contact yesterday. Another commenter has already pointed out that OH Assist has not previously been named among any of Atos’ subsidiaries… Perhaps it has suddenly become much more visible? Were YOU aware of it before today? How many people were? It’s not adding up – something else is in the offing, or is it just me? Assisting disabled people to the grave or the crematorium oven. 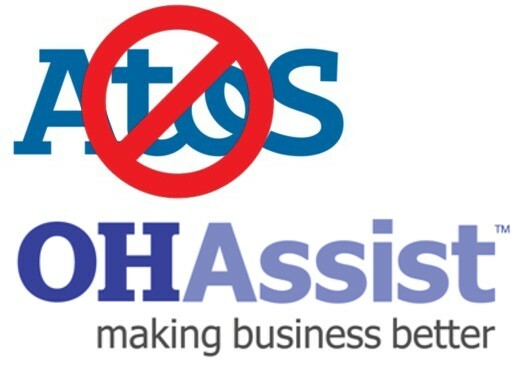 If you go to the OH Assist home page on the following link, and then scroll down to the very bottom of the page, you will see (if you look very carefully) a copyright sign with the words © Atos IT Services UK Limited 2014. All rights reserved. The copyright sign is half hidden behind a semi-opaque blue band running along the bottom of the screen! is there evidence that OH Assist are ATOS? My friends PIP claim was handed to assessors months ago and still lies in a queue- when i phoned up a couple of weeks back I was told it was with OH Assist- this predated the announcement that ATOS were moving out. Yes – OH Assist is definitely Atos by another name. Have a look at some of the other comments on the article; they provide added insight into this. OH Assist or is it Oh as in zero assist?